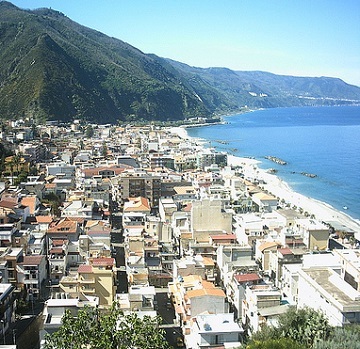 If you have been considering touring Southern Italy and didn't know where to start from, then look no further than this tour. Inspired by the Calabria Jones' project (Journey to discover the past) launched in 2012 by the Calabria Region, Domenico Russumanno (Made in South Italy Today - Ontario - Canada) and Giuseppe Piazzese are now proposing a tour to introduce this relatively unknowns Italian region to those discriminating tourists seeking a more meaningful traveling experience. The idea for such a tour was formulated by Domenico during one of his trips back to the land he came from, as a guest of Marisa Ranieri, in the city of Locri, a professor of ancient history, a writer and a poetess, "whose passion for our native land and her elegantly simple narrative style", helped me re-discovery that hidden side of Calabria I studied during my school years but was never able to give it a place in history", said Domenico. The tour was skillfully planned by Mr Giuseppe Piazzese, the manager/owner of Antichi Sentieri Travel Consultant, (also located in Locri), who, thanks to his many years of experience, was able to create a unique mosaic of destinations that we hope will provide our guests with local perspectives and insights to understand and appreciate the places we visit and the people we will meet. 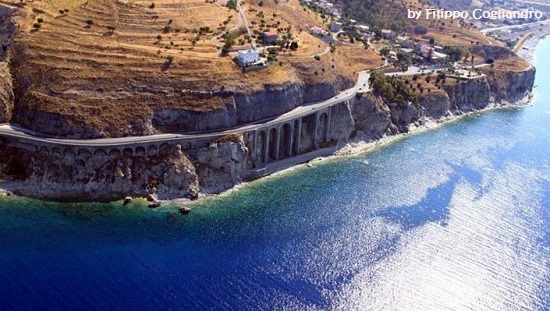 Calabria is colorful mix of Greek, Roman, Arabic and Byzantine influence. French and Spanish have left their mark too, making for a rich and unique travel experience. 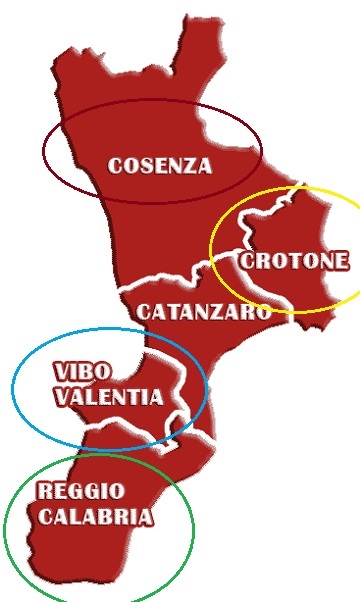 From village to village, in the region's heart, inlands and on the coasts, Calabria offers a historic lesson, a variety of different languages, wonderful landscape, art and handicrafts. 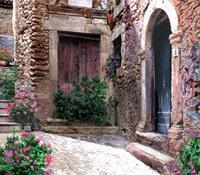 But to visit Calabria, you must not be in a hurry, because here time has another dimension. 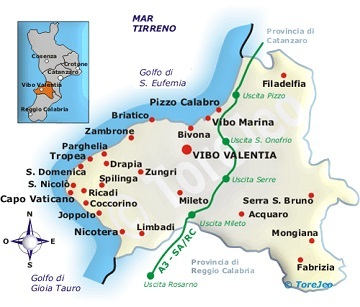 Only if you take it easy, Calabria becomes a discovery beyond its towns and the most and/or less renown touristic resorts. 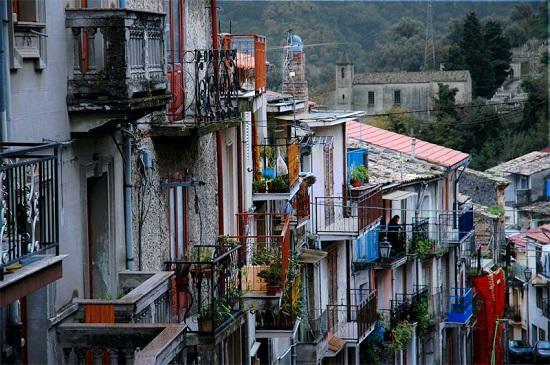 By visiting villages as Roghudi, where ancient Greek is still spoken, or in other villages such as Lungri, Civita, Frascineto, Acquaformosa where people still speak Albanian, you will then realize how Calabria has lived in a terrible isolation. The Byzantines (533) had a profound effect on Calabrian culture, creating an evocative corner of the Orient, particularly along the Calabrian Ionian coast. 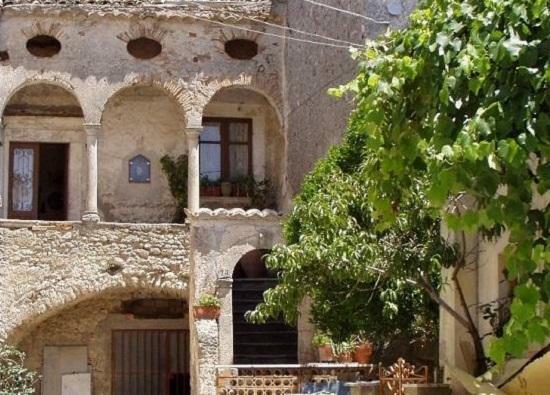 This period witnessed the revival of important centers such as Rossano, Santa Severina, Stilo and Gerace, which today house treasures and works of art and are noted for the fascinating architecture. 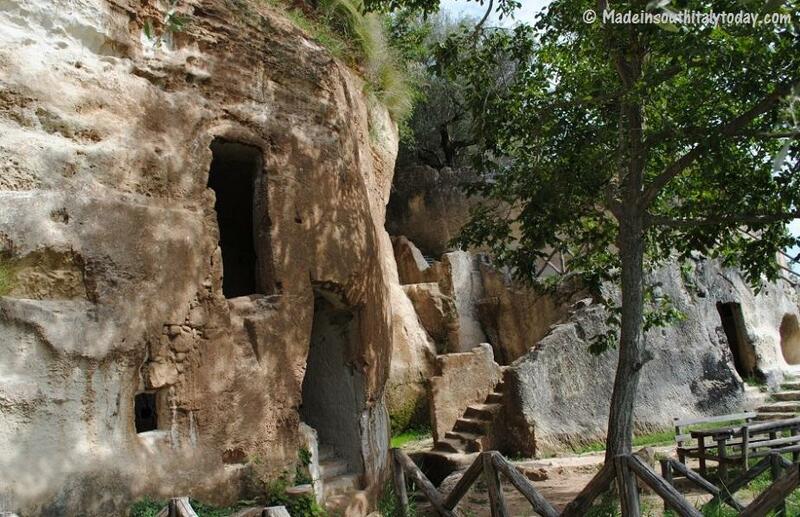 The 6th and 7th centuries witnessed the start of migration toward Calabria of the so-called Basilians monks from Asia Minor, fleeing from Muslim persecution. This migration increased from Sicily in the 10th century when the Muslims invaded the island. When - Spring and Fall. 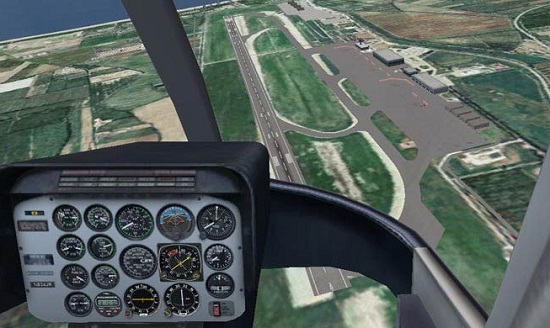 First day: Arrival at Lamezia Terme airport (or Reggio Airport). Greeting from your English speaking guide . 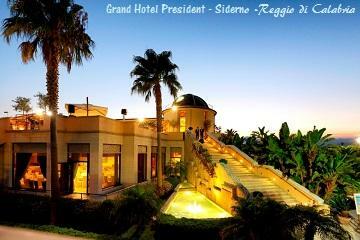 Transfer to the four star hotel on the Jasmine Riviera (Riviera dei Gelsomini). Welcome drink - Get to know the other members of the tour, supper, overnight stay. Second day - Following breakfast we will be boarding the bus and heading toward Mammola, a charming medieval mountain town where time seems to be at a standstill. ( small accordion) until we reach the town square where we will taste some local specialties and attempt a few steps of the tarantella dance. Mammola is well known for the so called 'stockfish' (not to be confused with what we call 'baccala'), which although imported from Norvey is considered a local traditional product due to the unique preparation method employed. We will be visiting a local family owned business to learn about the different phases of processing. Back at the hotel for lunch and on the move again soon after. This time we are going to the old town Siderno Superiore, for a short walk along the picturesque alleys of the ancient village characterized by beautiful buildings. Here, accompanied by the insistent sounds of drums, we will be watching the so called 'Dance of the Giants', a two meters high figures which in ancient times were used in battle to intimidate and strike fear in the opponents. 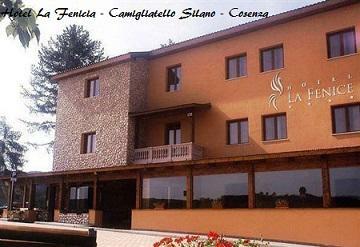 Dinner will take place at a local trattoria where we will be tasting local typical products. 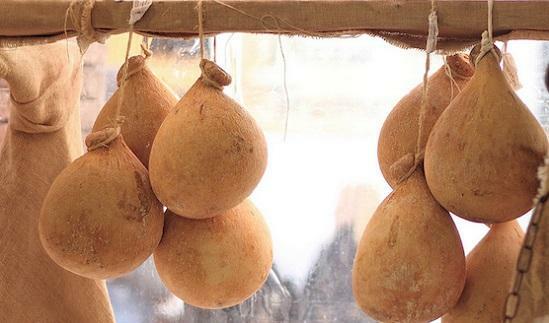 The meal consists of about 20 courses between hot and cold, accompanied by the expert explanations of the cook, among them, the famous salami of " il nero di Calabria" (the black pig of Calabria) and of course, some of our many tasty cheeses. Obviously there will be more dancing and music too (not in the program, but it happens anyway), performed by our skilled host who will introduce us to some of Calabria's traditional instruments. Overnight stay at the hotel. Terzo giorno (Third day) - Breakfast. 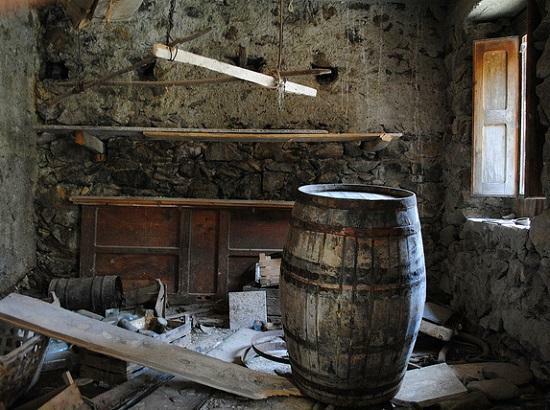 Get your video and picture taking gadgetry on the ready, we will be traveling to the ghost town of Roghudi Vecchio, part of Calabria Grecanic. The excitement will start as soon as we leave the main road and for some of you this might be the highlight of the tour. 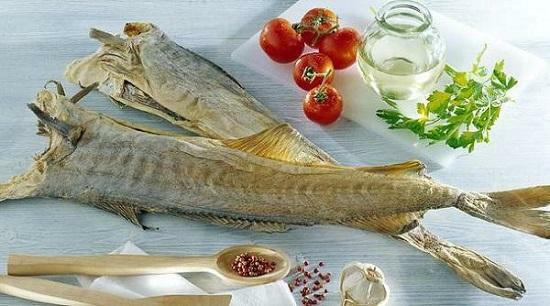 Return to Bova and lunch in a restaurant where you can choose some local Hellenic dishes. Appetizer : Aperitif, a variety of local cheeses such as ricotta, bruschetta, salami made from the "black of Calabria", lestopitte (visible on the top left), grilled seasoned vegetables, omelet, olives, beans and local wild mushrooms (Calabria is Italy's biggest producer of wild mushrooms). First dishes : homemade macaroni with meat sauce and pork or calf (or goat at request). seconds: mixed grilled black pig, goat meat "alla Vutana" (Goat stew, based on the season ) meatballs with ricotta cheese. Side dishes and drinks: mixed salad, season vegetables and fruits. water, local wine, limoncello, bergamotto. Sweets of the season. 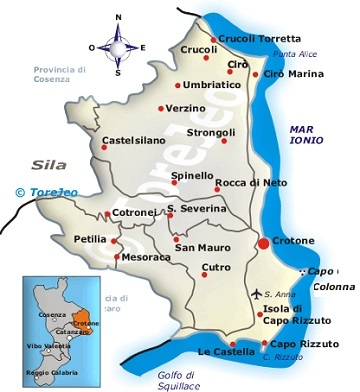 In the afternoon we will take a walking tour of Bova, the town we have been staying in, one of Calabria's most important "grecanici" town whose inhabitants still speak the ancient language of Homer. We will spend most of the afternoon strolling through the historical Centre, discovering its narrow arched streets, small squares and enjoying the view of the not far away coast. The evening will find us back at the hotel where we will have dinner and hang around until bed time. For day four of the tour we have planned a visit to the "other side". 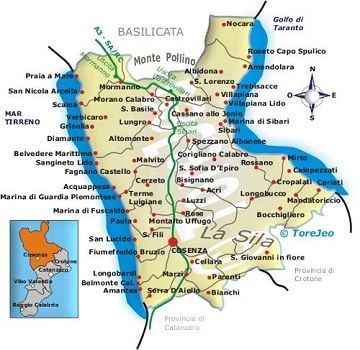 This day we will be driving toward Reggio di Calabria, Scilla and Bagnara Calabra ... a journey you will remember for a long time to come. 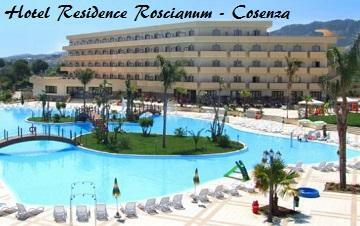 Reggio di Calabria - Our first date will be with two specimen of ancient Greece. 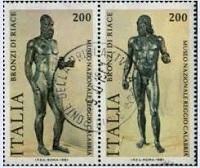 You might know them as the 'Bronzes of Riace'. We do not know much about them, nor we do know where they came from. The two magnificent bronze sculptures were discovered in the depths of the Ionian sea near the town of Riace , hence the name. What else is there to see in Reggio. 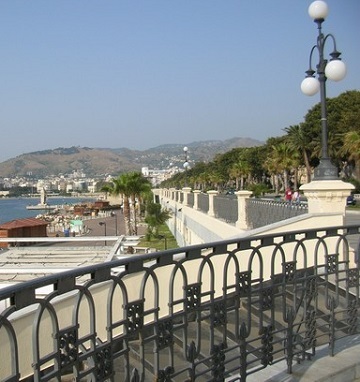 According to Italian poet Gabriele d'Annunzio, Reggio's promenade ( lungomare) is one of Italy's most beautiful , "il kilometro pu' bello 'd'Italia". Following is a visit to the Castle, the Cathedral ...and the restaurant. 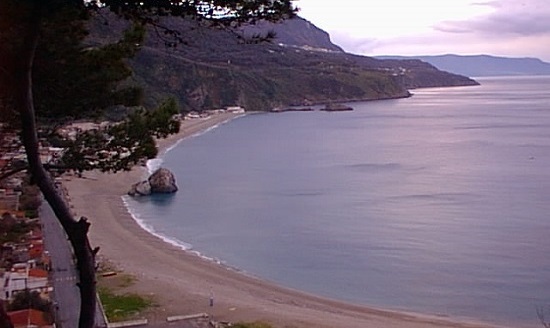 Toward Scilla and Bagnara: With the taste of fresh grilled fish and red wine still lingering in our mouth we will once again start moving... further north. We are now approaching the Violet coast, so called because of the color reflection in the water at certain times of the year. 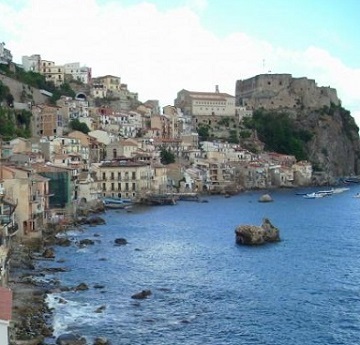 The 2nd stop of the day is the romantic fishing village of Scilla, pearl of the Mediterranean, standing on a picturesque location overlooking two bays. In Homeric Greek mythology, Scylla was a monster that lived on one side of the Messina strait opposite its counterpart Charybdis (Scilla e Cariddi). Scylla was rationalized as a rock shoal (described as a six-headed sea monster) on the Calabrian side of the strait and Charybdis was a whirlpool on the Sicilian side. 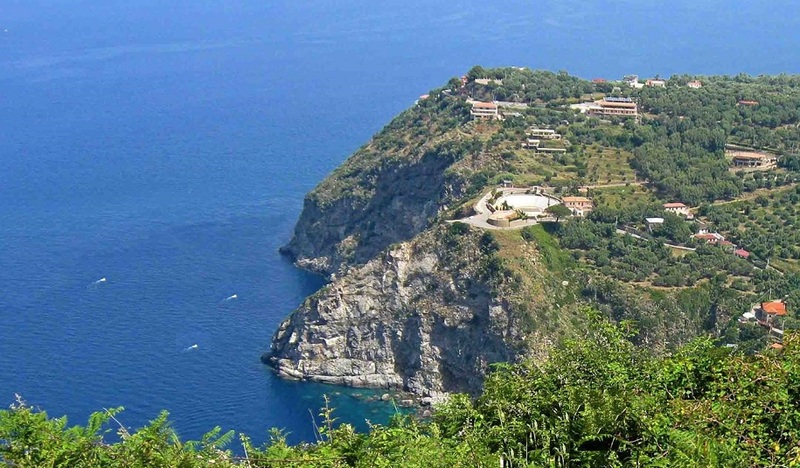 Next stop is Bagnara Calabra, famous for the "pesca del pescespada" the swordfish fishing. The village itself is another typical fishing hamlet, characterized by its narrow and charming arched streets. We will be visiting a pastry shop (pasticceria) for a taste of some local sweets, after which we head back 'home' for our evening meal and a good night sleep. Quinto giorno - 5th day - From the Greek civilization to the Middle Ages. After " breaky" we will be visiting the ruins of a Roman Villa located in Casignana, known also for its wine and handicraft production (rapidly vanishing), of homemade blankets with traditional decoration. 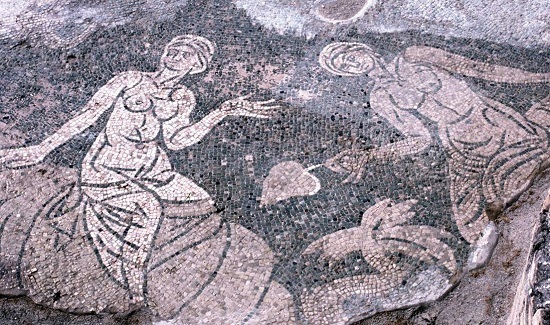 The roman villa (ruins) is one of Southern Italy's most important where is possible to admire some mosaic work and the thermal heating system of the time. 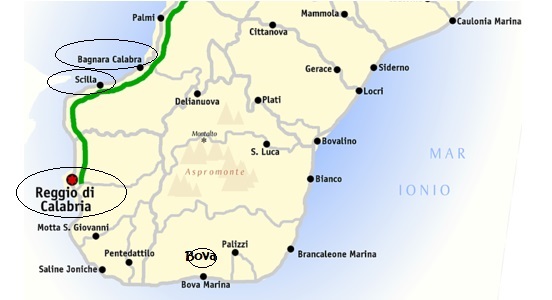 In the nearby town of Cimina' (Kymina in Greek) we will be visiting a small local factory where we will be watching the soft cheese cacio cavallo being made. By now its time for lunch which consist of typical specialties, such as potato fritters, cheeses, salami, fresh pasta with mushrooms and wild boar,(goat in summer), rolled pork roast, salads, drinks and desserts. 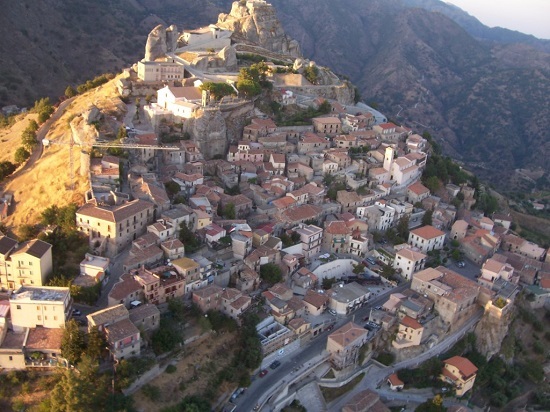 We will then transfer to Gerace also know as the "Florence of the South" a very enchanting town located high on a hill with a breathtaking view of the valley below. 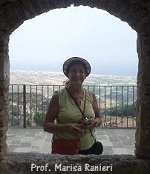 Gerace was a very a important medieval religious center. Walk through the local craft shops, tasting of wine, local sweets, jam and cheese. 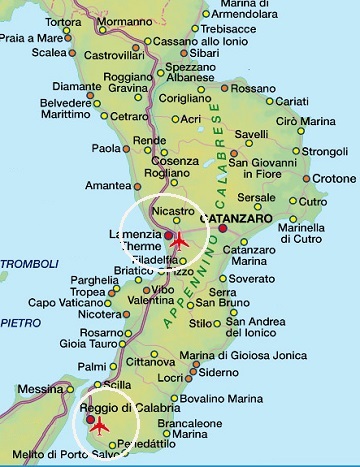 Pick up at Lamezia or Reggio Airport. Room extra charges might include a visitor tax. 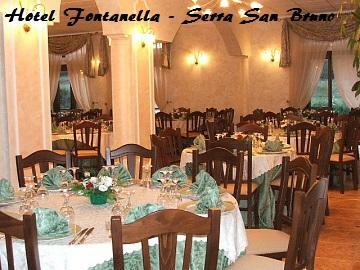 Antichi Sentieri a travel agency established in 2002 which specializes in cultural and educational tourism. Not included is the flight to and from Italy and to the final destination. Either Lamezia or Reggio di Calabria Airport. Balance 20 days prior the tour date. We can tailor one of our existing itineraries to fit your needs. 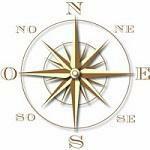 Just let us know the duration, departure date, standard of hotels, destinations, special interests , and we do the rest. Puglia - Basilicata - Sicily. For couples or small groups. Tell us what might interest you and we will propose one of our tour. 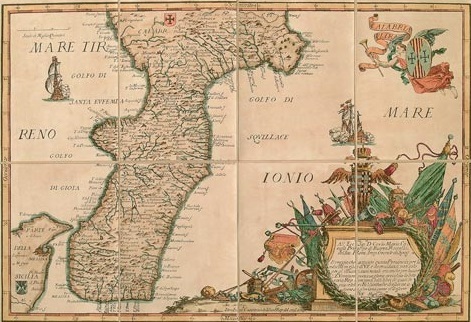 It has often been said that Calabria wrote a chapter in world history with the arrival of the first Greek Colonies , that history can be read not only in the streets, on monuments, in the archeological museums, but also in the ethnographical and folklore collections. 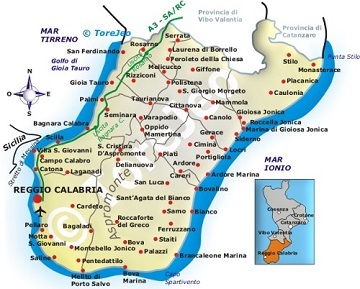 So, come and see Calabria, Italy’s South End and, we are sure about it, you’ll come back again and again. "The time of sword fish"
Vittorio De Seta (circa 1950). 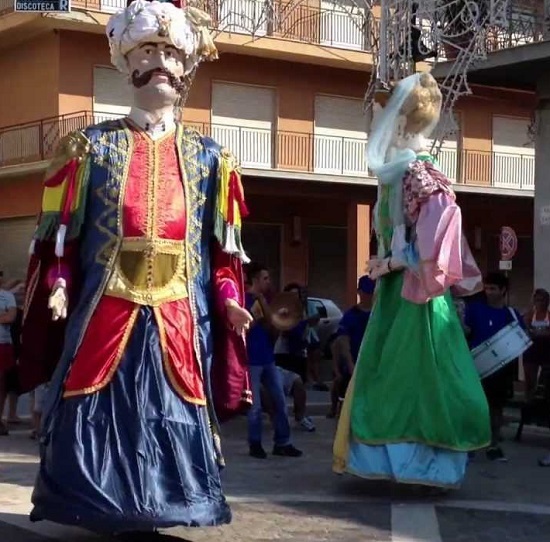 The dance of the "giants"
Below, images of the Procession of the Pupazze, a bovese (Village of Bova) ancient custom being celebrated on the day of Palm Sunday. The Pupazze (puppets) female figures are made ​​with intertwined olive leaves . Their origin goes back in time to the myth of Persephone, who symbolizes the blossoming of nature. In Classical Greek art, Persephone is invariably portrayed roped; often carrying a sheaf of grain. The title of the catchy song is Ela Elamu Condà (the ancient Greek language only spoken in Calabria and Puglia) translated it means "Come Come Closer". Below - A beautiful Bossa Nova version during a sing along. Come and join us. The video below gives you a better idea of the harsh surroundings to which the people had to adapt. 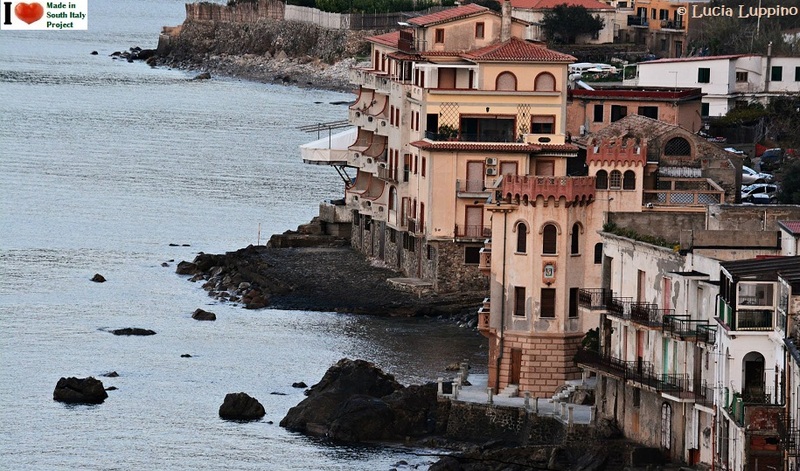 Scilla , one of Italy's most beutiful town. 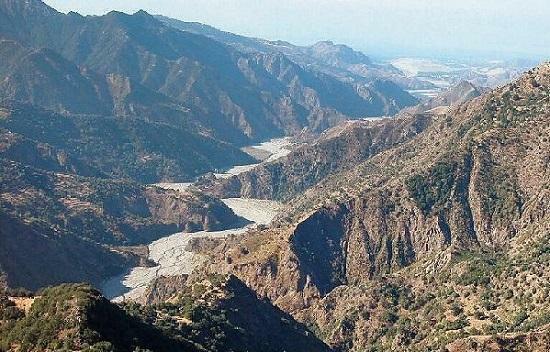 Trekking the rugged mountains of Calabria...we will bring you there .